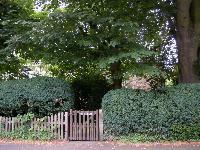 The Orchard is Grade II listed (ref. 1485/152). 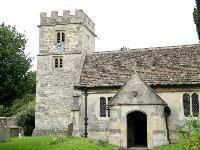 It dates from the early eighteenth century, and is built of limestone rubble. The farmyard was where Orchard Cottage at 18 Oxford Road now stands. 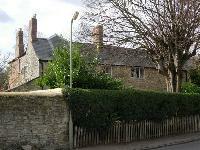 The house was inherited from John Sayer, a butler of Balliol College, by James Langford. It then passed to Ann Langford, who sold it to William Loder in 1813. On Loder's death in 1818 it passed to his widow, Mary, who sold it to the Marston farmer, Richard Rippington. His widow inherited it in 1841, and she left it to her daughter, Mrs Mary Cannon, wife of the farmer William Cannon. In 1876 Mary Cannon left it to her daughter, another Mary, who had married John Honour, and the couple were living in the house at the time of the 1881 census. Mary (13), Helen (11), John (9), Alice (6), Charles (4), Margarete (2), and Henry (1). Also living with them was Mary's sister, Ann Cannon, an unmarried landowner of 34. The Orchard ceased to be a farm in the late nineteenth century. John Honour was still living at the Orchard in 1913, and a Mrs Honour lived here in 1935 and 1947.